For something a little different on Earth Day, I spent part of the morning down at the ABC 15 studios talking about vegetable gardening on the Sonoran Living morning show. You can view the segment by clicking on the video link to the right, on this page. It went pretty well, due entirely to the host, Stephanie Sandoval; one of the things that always interests me about seeing the "inside" is the realization of how much skill it takes to make things look easy. I have a question about soil and compost: Can I use potting soil and regular dirt, mixed, instead of compost? If not, can I purchase compost? Also with tomato plants when they start to bear fruit, should I wean out leaves and bottom shoots ? I have three plants that I started with, and they are starting to bloom and bear fruit. 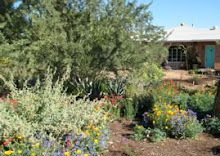 Great questions, and both issues are important in the Desert Garden. First to the soil and compost. Whenever possible, the foundation for your vegetable garden should be your native soil. Real soil, the kind we buy with the house, is chock full of desirable minerals and other plant nutrients; the minerals we eat in our vegetables come from the soil in which they grew. Potting soil doesn't have those good qualities. So our goal always is to amend out native soil with compost or other organic material, rather than to use potting soil (besides, by volume, potting soil is expensive!) And don't be tempted to mix potting soil in as a substitute for compost; it really isn't the same thing and it won't do a good job. If you're not yet making your own compost, you can buy it in bags or in bulk. Mix it onto your native garden soil, and you're on your way. Now for the tomatoes: make life easier on yourself and on your tomatoes, and don't pinch out leaves and bottom shoots. In other climates, gardeners often pinch out extra tomato shoots and leaves to open up the plant, promoting ripening and light in the interior. Here in the Desert Garden, we want to do just the opposite. Very soon now, our weather will be steadily hot and sunny, and that's hard on the tomatoes. If you leave the leaves and shoots, they help to form a shady and cooler canopy that will help to protect the ripening fruit; that's one of the best ways to ensure good tomatoes in the desert. A correspondent recently wrote in to ask why all the seed packets for melons and squash tell us to plant the seeds in mounds, or hills. Simple answer: Because the people who write the seed packets don't live in the desert. For much of the country, excess water can be one of the downfalls of the vegetable garden. Soggy soil results in seeds that rot before they sprout, cold soil with no air, and rotting roots in already growing plants. Their solution – and it's a good one – is to plant on raised ridges, hills, or mounds that allow the soil to warm and drain. First, we want our garden planting areas to collect as much rain water as they can, and to hold as much irrigation water as possible; anything that leads water away from your vegetables can result in dry soils and consequent poor plant growth. The second, and less intuitive, reason has to do with our salty soils and water. If you've ever watered a patch of bare desert soil and then let it dry out in the sun, you may have noticed a white or yellowish-white residue left on the soil surface; if there are clods of dirt in the area, they may have been completely encased in this residue. That residue is made up of salts that have been dissolved out of the soil and have then migrated to the soil surface. As the water evaporates out of the soil, the salts are deposited at the highest point of evaporation. If we were to plant our vegetables on ridges or mounds, the highest point of evaporation would be right where the seedlings come out of the soil, resulting in salt deposition at the tender spot where the roots meet the stem at soil level; if you recall what the Romans did to Carthage, you know that's really bad for our plants. So here's what we do instead: after you've prepared your soil by digging in plenty of compost, use a rake, or your hands, to form a planting basin. Just pull some soil aside to make little "walls" that surround the area you'll be planting, then plant your seeds or plants in the bottom of that basin. Not only will that allow rain and irrigation water to collect where it's most needed, but it will also result in the salts being deposited on the high edges of the basin, well away from the plants.